First, I’m so glad she chose pink for me. Second, how cute is that crown on top?! And third, I’ve taken the above statement on as my new mantra. This industry has too many stresses that are too easy to get caught up in, especially if you’re stuck in the query trenches (like me!) or trudging down the long submission road (so I’ve heard!). I often find myself so keyed up about query etiquette, social networking, the perfect pitch, blogging and blog reading, the unforeseeable future of publishing, who’s gotten how big an advance, and (insert any number of trivial things here), that I forget my main goal: Write and write well. So, from now on I’m going to KEEP CALM and WRITE ON. You should too! *Carla has an amazing talent for photography, among many other things. Oh, I love it. I’m with Jessica, I’m making this my wallpaper. I have a turqoise Get Excited and Make Things version of this on my laptop, I should really get around to printing it out . . . Maybe they would look nice as a pair, hmm. 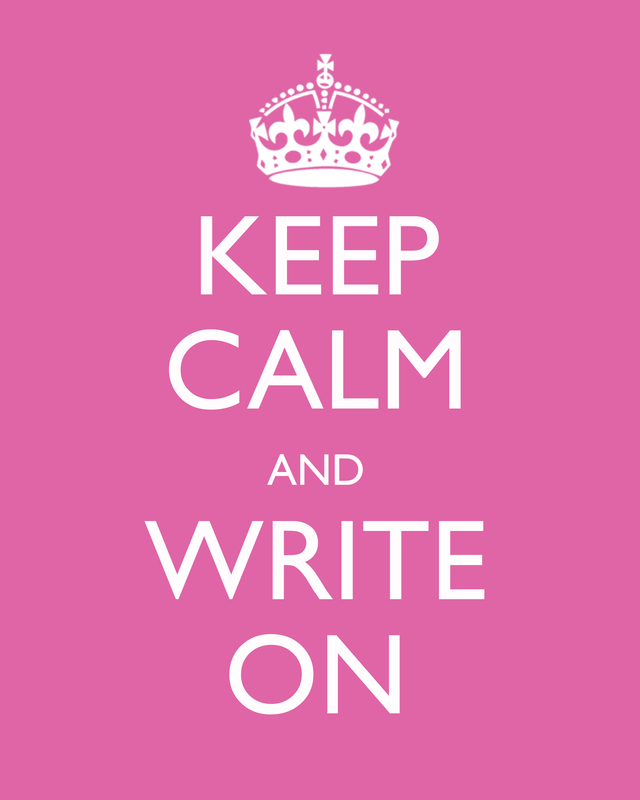 Anyway, Keep Calm and Write On! (I just might have to get something similar for my office!) It really is a great mantra. great! love it. Will steal and put on my blog!